If I was Kim Newman I’d begin this post on Spike Lee’s BLACKKKLANSMAN by pointing out the existence of the 1966 Ted V. Mikels joint THE BLACK KLANSMAN, and the black sort-of klansmen in SHOCK CORRIDOR and THE KLANSMAN (O.J. Simpson, name-checked in Lee’s film). And then reference THE SPOOK WHO SAT BY THE DOOR, Ivan Dixon’s genuinely revolutionary version of the conceit, in which a black man joins the CIA to learn guerrilla techniques he can use in the struggle. But I’m not Kim Newman. I don’t even own a cape. So, in a sense, the criticism of this film was justified — it used real-life murders as an excuse to include a joke about a fifties horror movie. If I were the relative of a victim, I’d be offended. In fact, I’m just someone who’s seen THE FLY and I’m still offended. But I did belatedly see INSIDE MAN and liked it a lot, so I’ve been thinking about giving him another chance. The movie is shot on 35mm for an authentic blaxploitation look, although the design seems to consistently situate it bang in the middle of that decade. Nothing said 1979 to me, although maybe Colorado Springs moved a touch slower than elsewhere. Having just watched THE STANFORD PRISON EXPERIMENT, whose attention to verisimilitude was a little marred by some unconvincing wigs and cookie-dusters reminiscent of Spike Jonze’s Sabotage video, I was relieved that the wig-work here was convincing and, to me, the movie didn’t cross over into seventies parody. Any time you watch an actual blaxploitation movie, there will be several costumes worn in apparent earnest that you could never use with a straight face in a modern movie set in that period. What the movie does give us is some excellent performances — John David Washington is an instant star, funnier than his famous dad, Adam Driver is as good as we’ve come to expect, and there’s an extremely powerful cameo from Harry Belafonte which forms a major part of the best sequence I’ve ever seen from Lee. Now THAT’S an hommage, if you like. (Lee’s always been good at finding roles for iconic black actors, and I’m grateful to him for giving Ruby Dee and Ossie Davis plum late-life parts). And at the end there’s one of his patented dolly-the-actors-with-the-camera shots, and it’s the best iteration of that particular conceit I’ve seen from him. And I got a fleeting sense, from the way the movie folds in bits of Griffith’s BIRTH OF A NATION and implicates it in the resurgence of the Klan, that the technique has some special meaning for Lee (it must, for him to use it so insistently), having something to do with the intrusion of movies into life. Like most films set in psych wards, the cast is divided between picturesque extras who shuffle or stand frozen in corridors, suggesting complete mental alienation by means of pantomime, and characters who suffer life traumas and present symptoms of deep unhappiness and a tendency to fly off the handle, but nothing much in the way of mental illness. The main exception is the rather brilliant casting of Oscar Levant, a real-life neurotic (“There’s a fine line between genius and insanity. I have erased this line”) who movingly suggests the struggle of an intelligent man to comport himself with dignity while he feels himself disintegrating within. 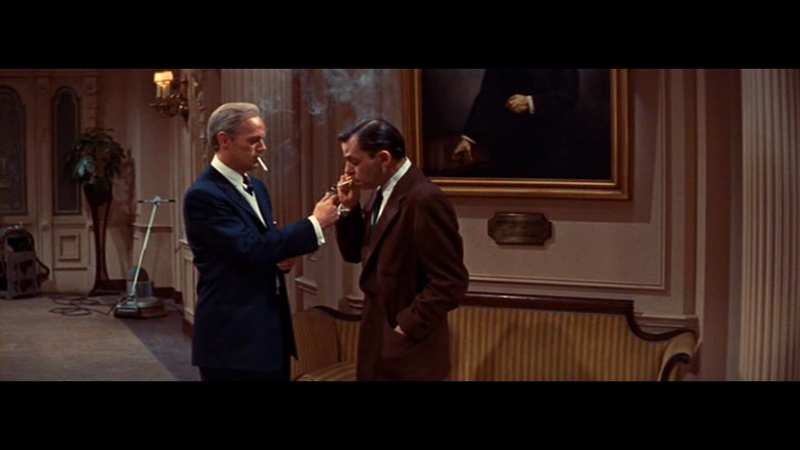 The character’s habit of offering cigarettes to head shrink Richard Widmark is a pathetic and touching sign of his need to appear in control and useful. He’ll break your heart. THE COBWEB shares a star (Charles Boyer) and a message with Gregory La Cava’s PRIVATE WORLDS — a rather commendable view that sanity and insanity are points on a spectrum rather than polar opposites. In both films the staff of a psychiatric hospital and their spouses are shown as being just about as unstable and neurotic as the patients. La Cava had been treated for alcoholism and Minnelli had until recently been married to Judy Garland, so both could claim some familiarity with troubled states of mind. But their movies ignore clinical reality, real-life methods of treatment, and mostly their characters suffer not from mental disease but from melodramatic versions of ordinary unhappiness. Chief among these is John Kerr, very effective in a low-charisma, understated way. His character is bright, discontented, and prone to flying off the handle — like a Nick Ray adolescent rather than a mental patient. He’s well-written enough and well-observed enough (screenplay by John Paxton with an assist by original novelist William Gibson — no, not that one) to tie the film’s various strands together. The all-star cast around him works well too. 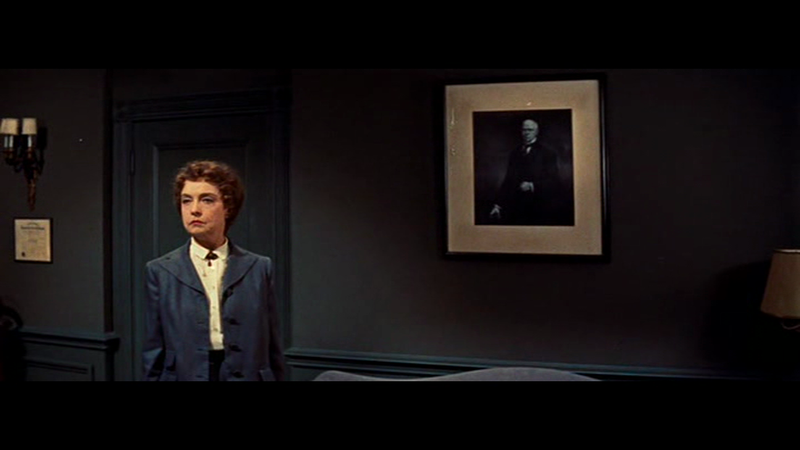 Lauren Bacall is particularly charming, even when hanging around in the far background of long takes (getting in shape for her Lars Von Trier movies) and Lillian Gish is particularly strong as an administrator who’s been in her job so long she’s forgotten what the hospital exists for. With the striking name of Vicky Inch, she’s a pugnacious little gnome dominating every frame she appears in. And making every frame she’s in more beautiful. Also, Gloria Grahame does a lot of good and important work with her breasts. 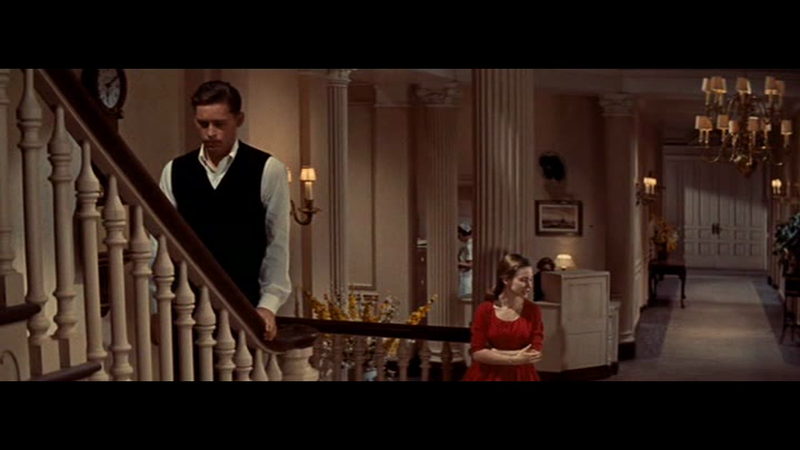 Minnelli’s framing and colour sense is so exquisite, and the script so satisfying (it’s kind of a network narrative like SOME CAME RUNNING, but so tightly knotted together you don’t notice), that the lack of a realistic story world doesn’t matter too much. There’s even room for a reading which sees the institution as a metaphor for America, which the movie endorses with a line about “giving it back to the Indians,” if self-governance among the patients doesn’t work. (SHOCK CORRIDOR would be a pathetic film if it were really about mental illness — instead it’s about political illness in the body politic, with America portrayed as a hospital that makes you crazy.) 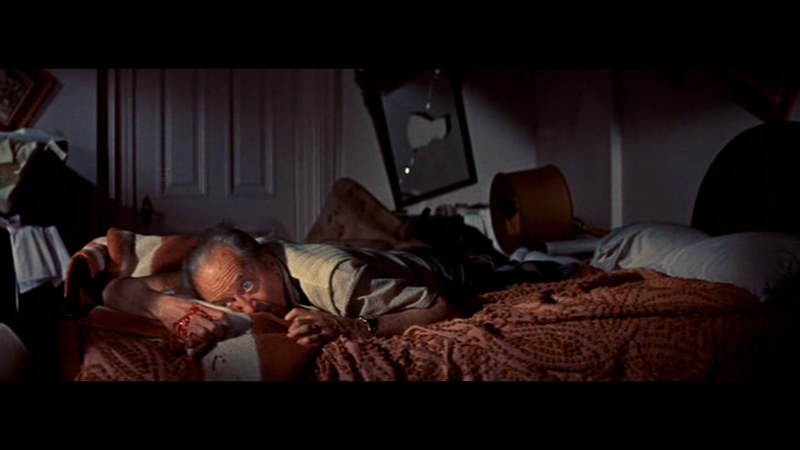 And in the plotline, which is mainly about (no kidding) the selection of drapes for the hospital library, it could stand as the middle film in Minnelli’s film-making series — THE BAD AND THE BEAUTIFUL shows how neurotic film art is, feeding on the quirks and weaknesses of the cast and crew — the later TWO WEEKS IN ANOTHER TOWN begins with a movie star getting out of one asylum and plunging into the madhouse of the movie set — in THE COBWEB, a group of twisted, tortured and ill-matched people come together and try to create order, balance, beauty. Quote of the Day: Ban This Sick Filth! ‘The various reasons cited by the board for its refusal to grant a certificate to SHOCK CORRIDOR in 1963 are confusing as well as contradictory. First of all the Board said that its depiction of conditions in an American mental asylum bore no comparison with those in hospitals within Britain. But this could equally apply to gangster films, Westerns or, for that matter, musicals. Secondly, the film could also frighten cinema-goers who had relatives in mental institutions. This had been the rationale behind the BBFC’s [British Board of Film Censors’] rather extensive cutting of the German Expressionist film THE CABINET OF DOCTOR CALIGARI back in 1928, and even then it appeared to be a catch-all excuse. 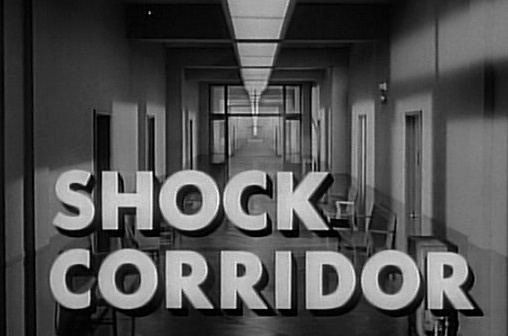 I remember a discussion with a fellow student when I was at art college: they had seen SHOCK CORRIDOR on T.V. and been outraged: “Whoever made this obviously knew nothing about mental illness.” My defense was that the film wasn’t truly about mental illness. The three main patients in the film are all suffering from political illnesses. If we except the hospital as a nightmare vision of America, then Fuller’s decision not to reflect the realities of psychiatric conditions as we currently understand them becomes more explicable. In THE BIG RED ONE there’s a scene in a Walloon insane asylum which has been taken over by Nazi forces. The Americans attack, and there’s a shoot-out during which inmates, some of whom have learning difficulties and some of whom presumably have psychiatric conditions (I have no idea whether people with such disparate conditions would really have shared a Walloony-bin in the 1940s, but it does seem possible) continue to eat their lunch, unperturbed by the fire-fight raging around them. Of course, this isn’t realistic. A person with Down’s Syndrome, depression, schizophrenia or pretty much any other mental condition would be likely to react with even more alarm to such an occurrence than you or I would. Fuller’s intent is clarified when an inmate snatches up a fallen soldier’s rifle and blows away a few of his fellow diners. “I am like you — I am sane!” he asserts. The scenario is satirical, Swiftian, rather than realistic, and the idea that warfare and murder are proofs of sanity has been floated — and rendered absurd. Censorship is always political. It’s interesting that one of the things the BBFC seems to have been afraid of is that relatives of those committed to institutes would become concerned about the well-being of their kin. The likely outcome of such a thing would be, what? They might visit their relatives to check that they’re being well looked-after, and inspect conditions in the asylum. Is that so alarming? As to the censors’ other reasons, it has since been proved that pretty much anybody can get themselves admitted to a psych ward by reporting false symptoms (assuming there’s a spare bed). Psychiatrists have been shown to be no better than anybody else at detecting lies — judges and lawyers are equally gullible, with only professional SPIES being any better than you or I (they’re specifically TRAINED to know when they’re being bullshitted). And could a mental hospital drive you mad? I think this idea is based on a false assumption that any one of us can be “driven mad” by stressful circumstances. But certainly psychiatric hospitals can often be depressing, and sometimes alarming places, often ill-suited settings for any kind of recovery process. Filling a large, institutional building with mentally ill people, and maintaining some kind of calm, pleasant atmosphere, is a tall order, but a civilized country ought to try a lot harder to do it than we do.